It is good for programmers to understand what goes on inside a processor. The CPU is at the heart of our career. What goes on inside the CPU? How long does it take for one instruction to run? What does it mean when a new CPU has a 12-stage pipeline, or 18-stage pipeline, or even a "deep" 31-stage pipeline? Programs generally treat the CPU as a black box. Instructions go into the box in order, instructions come out of the box in order, and some processing magic happens inside. As a programmer, it is useful to learn what happens inside the box. This is especially true if you will be working on tasks like program optimization. If you don't know what is going on inside the CPU, how can you optimize for it? 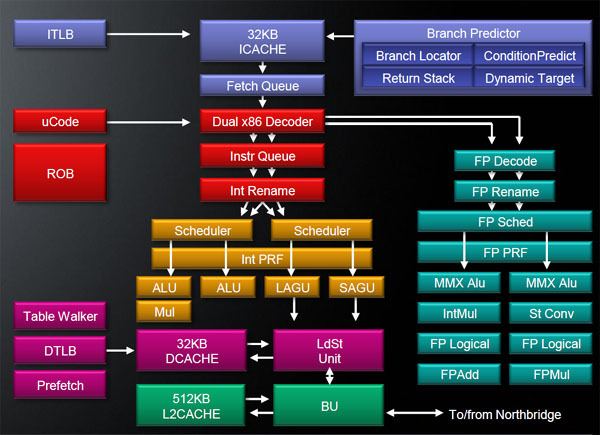 This article is about what goes on inside the x86 processor's deep pipeline. First, this article assumes you know a bit about programming, and maybe even a little assembly language. If you don't know what I mean when I mention an instruction pointer, this article probably isn't for you. When I talk about registers, instructions, and caches, I assume you already know what they mean, can figure it out, or will look it up. Second, this article is a simplification of a complex topic. If you feel I have left out important details, please add them to the comments at the end. Third, I am focusing on Intel processors and the x86 family. I know there are many different processor families out there other than x86. I know that AMD introduced many useful features into the x86 family and Intel incorporated them. It is Intel's architecture and Intel's instruction set, and Intel introduced the most major feature being covered, so for simplicity and consistency I'm just going to stick with their processors. Fourth, this article is already out of date. Newer processors are in the works and some are due out in a few months. I am very happy that technology is advancing at a rapid pace. I hope that someday all of these steps are completely outdated, replaced with even more amazing advances in computing power. From an extremely broad perspective the x86 processor family has not changed very much over its 35 year history. There have been many additions but the original design (and nearly all of the original instruction set) is basically intact and visible in the modern processor. The original 8086 processor has 14 CPU registers which are still in use today. Four are general purpose registers -- AX, BX, CX, and DX. Four are segment registers that are used to help with pointers -- Code Segment (CS), Data Segment (DS), Extra Segment (ES), and Stack Segment (SS). Four are index registers that point to various memory locations -- Source Index (SI), Destination Index (DI), Base Pointer (BP), and Stack Pointer (SP). One register contains bit flags. And finally, there is the most important register for this article: The Instruction Pointer (IP). The instruction pointer register is a pointer with a special job. The instruction pointer's job is to point to the next instruction to be run. All processors in the x86 family follow the same pattern. First, they follow the instruction pointer and decode the next CPU instruction at that location. After decoding, there is an execute stage where the instruction is run. Some instructions read from memory or write to it, others perform calculations or comparisons or do other work. When the work is done, the instruction goes through a retire stage and the instruction pointer is modified to point to the next instruction. This decode, execute, and retire pipeline pattern applies to the original 8086 processor as much as it applies to the latest Core i7 processor. Additional pipeline stages have been added over the years, but the pattern remains. The original processor was simple by today's standard. The original 8086 processor began by evaluating the instruction at the current instruction pointer, decoded it, executed it, retired it, and moved on to the next instruction that the instruction pointer pointed to. Each new chip in the family added new functionality. Most chips added new instructions. Some chips added new registers. For the purposes of this article I am focusing on the changes that affect the main flow of instructions through the CPU. Other changes like adding virtual memory or parallel processing are certainly interesting and useful, but not applicable to this article. In 1982 an instruction cache was added to the processor. Instead of jumping out to memory at every instruction, the CPU would read several bytes beyond the current instruction pointer. The instruction cache was only a few bytes in size, just large enough to fetch a few instructions, but it dramatically improved performance by removing round trips to memory every few cycles. In 1985, the 386 added cache memory for data as well as expanding the instruction cache. This gave performance improvements by reading several bytes beyond a data request. By this point both the instruction cache and data cache were measured in kilobytes rather than bytes. In 1989, the i486 moved to a five-stage pipeline. Instead of having a single instruction inside the CPU, each stage of the pipeline could have an instruction in it. This addition more than doubled the performance of a 386 processor of the same clock rate. The fetch stage extracted an instruction from the cache. (The instruction cache at this time was generally 8 kilobytes.) The second stage would decode the instruction. The third stage would translate memory addresses and displacements needed for the instruction. The fourth stage would execute the instruction. The fifth stage would retire the instruction, writing the results back to registers and memory as needed. By allowing multiple instructions in the processor at once, programs could run much faster. 1993 saw the introduction of the Pentium processor. The processor family changed from numbers to names as a result of a lawsuit--that's why it is Pentium instead of the 586. The Pentium chip changed the pipeline even more than the i486. The Pentium architecture added a second separate superscalar pipeline. The main pipeline worked like the i486 pipeline, but the second pipeline ran some simpler instructions, such as direct integer math, in parallel and much faster. In 1995, Intel released the Pentium Pro processor. This was a radically different processor design. This chip had several features including out-of-order execution processing core (OOO core) and speculative execution. The pipeline was expanded to 12 stages, and it included something termed a 'superpipeline' where many instructions could be processed simultaneously. This OOO core will be covered in depth later in the article. There were many major changes between 1995 when the OOO core was introduced and 2002 when our next date appears. Additional registers were added. Instructions that processed multiple values at once (Single Instruction Multiple Data, or SIMD) were introduced. Caches were introduced and existing caches enlarged. Pipeline stages were sometimes split and sometimes consolidated to allow better use in real-world situations. These and other changes were important for overall performance, but they don't really matter very much when it comes to the flow of data through the chip. In 2002, the Pentium 4 processor introduced a technology called Hyper-Threading. The OOO core was so successful at improving processing flow that it was able to process instructions faster than they could be sent to the core. For most users the CPU's OOO core was effectively idle much of the time, even under load. To help give a steady flow of instructions to the OOO core they attached a second front-end. The operating system would see two processors rather than one. There were two sets of x86 registers. There were two instruction decoders that looked at two sets of instruction pointers and processed both sets of results. The results were processed by a single, shared OOO core but this was invisible to the programs. Then the results were retired just like before, and the instructions were sent back to the two virtual processors they came from. In 2006, Intel released the "Core" microarchitecture. For branding purposes, it was called "Core 2" (because everyone knows two is better than one). In a somewhat surprising move, CPU clock rates were reduced and Hyper-Threading was removed. By slowing down the clock they could expand all the pipeline stages. The OOO core was expanded. Caches and buffers were enlarged. Processors were re-designed focusing on dual-core and quad-core chips with shared caches. In 2008, Intel went with a naming scheme of Core i3, Core i5, and Core i7. These processors re-introduced Hyper-Threading with a shared OOO core. The three different processors differed mainly by the size of the internal caches. Future Processors: The next microarchitecture update is currently named Haswell and speculation says it will be released late in 2013. So far the published docs suggest it is a 14-stage OOO core pipeline, so it is likely the data flow will still follow the basic design of the Pentium Pro. So what is all this pipeline stuff, what is the OOO core, and how does it help processing speed? In the most basic form described above, a single instruction goes in, gets processed, and comes out the other side. That is fairly intuitive for most programmers. The i486 has a 5-stage pipeline. The stages are - Fetch, D1 (main decode), D2 (secondary decode, also called translate), EX (execute), WB (write back to registers and memory). One instruction can be in each stage of the pipeline. There is a major drawback to a CPU pipeline like this. Imagine the code below. Back before CPU pipelines the following three lines were a common way to swap two variables in place. XOR a, b XOR b, a XOR a, b The chips starting with the 8086 up through the 386 did not have an internal pipeline. They processed only a single instruction at a time, independently and completely. Three consecutive XOR instructions is not a problem in this architecture. We'll consider what happens in the i486 since it was the first x86 chip with an internal pipeline. It can be a little confusing to watch many things in motion at once, so you may want to refer back to the diagram above. The first instruction enters the Fetch stage and we are done with that step. On the next step the first instruction moves to D1 stage (main decode) and the second instruction is brought into fetch stage. On the third step the first instruction moves to D2 and the second instruction gets moved to D1 and another is fetched. On the next stage something goes wrong. The first instruction moves to EX ... but other instructions do not advance. The decoder stops because the second XOR instruction requires the results of the first instruction. The variable (a) is supposed to be used by the second instruction, but it won't be written to until the first instruction is done. So the instructions in the pipeline wait until the first instruction works its way through the EX and WB stages. Only after the first instruction is complete can the second instruction make its way through the pipeline. The third instruction will similarly get stuck, waiting for the second instruction to complete. This is called a pipeline stall or a pipeline bubble. Another issue with pipelines is some instructions could execute very quickly and other instructions would execute very slowly. This was made more visible with the Pentium's dual-pipeline system. The Pentium Pro introduced a 12-stage pipeline. When that number was first announced there was a collective gasp from programmers who understood how the superscalar pipeline worked. If Intel followed the same design with a 12-stage superscalar pipeline then a pipeline stall or slow instruction would seriously harm execution speed. At the same time they announced a radically different internal pipeline, calling it the Out Of Order (OOO) core. It was difficult to understand from the documentation, but Intel assured developers that they would be thrilled with the results. Let's have a look at this OOO core pipeline in more depth. The OOO Core pipeline is a case where a picture is worth a thousand words. So let's get some pictures. The i486 had a 5-stage pipeline that worked well. The idea was very common in other processor families and works well in the real world. The Pentium pipeline was even better than the i486. It had two instruction pipelines that could run in parallel, and each pipeline could have multiple instructions in different stages. You could have nearly twice as many instructions being processed at the same time. Having fast instructions waiting for slow instructions was still a problem with parallel pipelines. Having sequential instruction order was another issue thanks to stalls. The pipelines are still linear and can face a performance barrier that cannot be breached. The OOO core is a huge departure from the previous chip designs with their linear paths. It added some complexity and introduced nonlinear paths: The first thing that happens is that instructions are fetched from memory into the processor's instruction cache. The decoder on the modern processors can detect when a large branch is about to happen (such as a function call) and can begin loading the instructions before they are needed. The decoding stage was modified slightly from earlier chips. Instead of just processing a single instruction at the instruction pointer, the Pentium Pro processor could decode up to three instructions per cycle. Today's (circa 2008-2013) processors can decode up to four instructions at once. Decoding produces small fragments of operations called micro-ops or u-ops. Next is a stage (or set of stages) called micro-op translation, followed by register aliasing. Many operations are going on at once and we will potentially be doing work out of order, so an instruction could read to a register at the same time another instruction is writing to it. Writing to a register could potentially stomp on a value that another instruction needs. Inside the processor the original registers (such as AX, BX, CX, DX, and so on) are translated (or aliased) into internal registers that are hidden from the programmer. The registers and memory addresses need to have their values mapped to a temporary value for processing. Currently 4 micro-ops can go through translation every cycle. After micro-op translation is complete, all of the instruction's micro-ops enter a reorder buffer, or ROB. The ROB currently holds up to 128 micro-ops. On a processor with Hyper-Threading the ROB can also coordinate entries from multiple virtual processors. Both virtual processors come together into a single OOO core at the ROB stage. These micro-ops are now ready for processing. They are placed in the Reservation Station (RS). The RS currently can hold 36 micro-ops at any one time. Now the magic of the OOO core happens. The micro-ops are processed simultaneously on multiple execution units, and each execution unit runs as fast as it can. Micro-ops can be processed out of order as long as their data is ready, sometimes skipping over unready micro-ops for a long time while working on other micro-ops that are ready. This way a long operation does not block quick operations and the cost of pipeline stalls is greatly reduced. The original Pentium Pro OOO core had six execution units: two integer processors, one floating-point processor, a load unit, a store address unit, and a store data unit. The two integer processors were specialized; one could handle the complex integer operations, the other could solve up to two simple operations at once. In an ideal situation the Pentium Pro OOO Core execution units could process seven micro-ops in a single clock cycle. Today's OOO core still has six execution units. It still has the load address, store address, and store data execution units, the other three have changed somewhat. Each of the three execution units perform basic math operations, or instead they perform a more complex micro-op. Each of the three execution units are specialized to different micro-ops allowing them to complete the work faster than if they were general purpose. In an ideal situation today's OOO core can process 11 micro-ops in a single cycle. Eventually the micro-op is run. It goes through a few more small stages (which vary from processor to processor) and eventually gets retired. At this point it is returned back to the outside world and the instruction pointer is advanced. From the program's point of view the instruction has simply entered the CPU and exited the other side in exactly the same way it did back on the old 8086. If you were following carefully you may have noticed one very important issue in the way it was just described. What happens if there is a change in execution location? For example, what happens when the code hits an 'if' statement or a 'switch" statement? On the older processors this meant discarding the work in the superscalar pipeline and waiting for the new branch to begin processing. A pipeline stall when the CPU holds one hundred instructions or more is an extreme performance penalty. Every instruction needs to wait while the instructions at the new location are loaded and the pipeline restarted. In this situation the OOO core needs to cancel work in progress, roll back to the earlier state, wait until all the micro-ops are retired, discard them and their results, and then continue at the new location. This was a very difficult problem and happened frequently in the design. The performance of this situation was unacceptable to the engineers. This is where the other major feature of the OOO core comes in. Speculative execution was their answer. Speculative execution means that when a conditional statement (such as an 'if' block) is encountered the OOO core will simply decode and run all the branches of the code. As soon as the core figures out which branch was the correct one, the results from the unused branches would be discarded. This prevents the stall at the small cost of running the code inside the wrong branch. The CPU designers also included a branch prediction cache which further improved the results when it was forced to guess at multiple branch locations. We still have CPU stalls from this problem, but the solutions in place have reduced it to the point where it is a rare exception rather than a usual condition. Finally, CPUs with Hyper-Threading enabled will expose two virtual processors for a single shared OOO core. They share a Reorder Buffer and OOO core, appearing as two separate processors to the operating system. That looks like this: A processor with Hyper-Threading gives two virtual processors which in turn gives more data to the OOO core. This gives a performance increase during general workloads. A few compute-intensive workflows that are written to take advantage of every processor can saturate the OOO core. During those situations Hyper-Threading can slightly decrease overall performance. Those workflows are relatively rare; Hyper-Threading usually provides consumers with approximately double the speed they would see for their everyday computer tasks. All of this may seem a little confusing. Hopefully an example will clear everything up. From the application's perspective, we are still running on the same instruction pipeline as the old 8086. There is a black box. The instruction pointed to by the instruction pointer is processed by the black box, and when it comes out the results are reflected in memory. From the instruction's point of view, however, that black box is quite a ride. Here is today's (circa 2008-2013) CPU ride, as seen by an instruction: First, you are a program instruction. Your program is being run. You are waiting patiently for the instruction pointer to point to you so you can be processed. When the instruction pointer gets about 4 kilobytes away from you -- about 1500 instructions away -- you get collected into the instruction cache. Loading into the cache takes some time, but you are far away from being run. This prefetch is part of the first pipeline stage. The instruction pointer gets closer and closer. When the instruction pointer gets about 24 instructions away, you and five neighbors get pulled into the instruction queue. This processor has four decoders. It has room for one complex instruction and up to three simple instructions. You happen to be a complex instruction and are decoded into four micro-ops. Decoding is a multi-step process. Part of the decode process involved a scan to see what data you need and if you are likely to cause a jump to somewhere new. The decoder detected a need for some additional data. Unknown to you, somewhere on the far side of the computer, your data starts getting loaded into the data cache. Your four micro-ops step up to the register alias table. You announce which memory address you read from (it happens to be fs:[eax+18h]) and the chip translates that into temporary addresses for your micro-ops. Your micro-ops enter the reorder buffer, or ROB. At the first available opportunity they move to the Reservation Station. The Reservation Station holds instructions that are ready to be run. Your third micro-op is immediately picked up by Execution Port 5. You don't know why it was selected first, but it is gone. A few cycles later your first micro-op rushes to Port 2, the Load Address execution unit. The remaining micro-ops wait as various ports collect other micro-ops. They wait as Port 2 loads data from the memory cache and puts it in temporary memory slots. They wait a long time... A very long time... Other instructions come and go while they wait for their micro-op friend to load the right data. Good thing this processor knows how to handle things out of order. Suddenly both of the remaining micro-ops are picked up by Execution Ports 0 and 1. The data load must be complete. The micro-ops are all run, and eventually the four micro-ops meet back in the Reservation Station. As they travel back through the gate the micro-ops hand in their tickets listing their temporary addresses. The micro-ops are collected and joined, and you, as an instruction, feel whole again. The CPU hands you your result, and gently directs you to the exit. There is a short line through a door marked "Retirement". You get in line, and discover you are standing next to the same instructions you came in with. You are even standing in the same order. It turns out this out-of-order core really knows its business. Each instruction then goes out of the CPU, seeming to exit one at a time, in the same order they were pointed to by the instruction pointer. There is still a case where you can be hit having to deal with an In Order CPU in games development and this is when you are writing code for a PS3 or X360(I know these aren't intel CPU's), just wanted to mention this otherwise very good article and very informative. The Playstation's Cell processor might be a fun one to write up, although it makes the x86 processor look easy. The x86 uses a "superpipeline" as described above. The Cell family uses a "synergistic" approach involving nine mini-cpus. It is true that each mini-cpu follows a mostly in-order pipeline, the mini-cpus have multiple parallel superscalar pipelines rather than a single pipeline. Among the mini-cpus there is one processor, the PPE, that does managerial work and operates as a command-and-control facility. There are 8 other processors, the SPEs, which are also fully-featured processors, and they do the work assigned by the PPE. Where the x86 can have at most six internal execution units running at once in addition to having instructions at various locations in the pipeline, the Cell can have over 50 execution units running simultaneously in addition to the array of deep pipelines on each mini-cpu. The combined piplines of all the processors with their parallel pipelines can collectively hold the equivalent of about a thousand x86 micro-ops in their buffers at any time. If x86 is a house party where a hundred or so instructions are invited, the Cell is a city block party. The Cell processor has been dubbed a "supercomputer on a chip" because of the many interconnected microprocessors. ... And now I'm writing an article again. I'll stop now. Since the PS4 and XBox720 are due out soon, talking about the older Cell processors would really just be a historical exercise. Great article. It finally taught me how speculative branching and branch prediction works! the i486 added superscalar pipelining. Superscalar means >1 instruction issue per cycle. So Pentium is superscalar, but 486 is just a pipelined scalar. For most users the CPU’s OOO core was effectively idle much of the time, even under load. It would be useless to have OoO if that was true. They mainly idle in cases of branch misprediction, cache miss, lack of parallelism in instruction stream or specific instruction mix (say, only integer instructions). Second thread could supply additional instructions to fill available compute resources. To help give a steady flow of instructions to the OOO core they attached a second front-end. None of SMT processors has entire frontend duplicated. Mainly queues, TLBs and tags here and there. Decoder is usually shared between threads and accessed in alternating cycles, or coarser granularity. In case of P4, both decoder and trace cache are shared. For the first one, since the word bothers you I'll remove it. For the second point, I really wish that were true in my experience. When I work on optimizing our code bases, I always get discouraged when vtune shows just how much time the CPU is sitting idle. Even when going through tight loops the CPU is mostly just sitting there waiting for the cache. I'm glad to hear your experiences are different than what I see and measure in our game engines. On the third point, I figured that was just an implementation detail. Even you point out that it is different between the various chips. I didn't mention it, just like the details about returning back to the ROB before retirement (which in my view is much more important because the pipeline actually loops back on itself) and was included in early drafts, but ultimately left out for clarity and simplicity. Looks like you think it is important, so thanks for sharing! In 2006, Intel released the "Core" microarchitecture. For branding purposes, it was called "Core 2" (because everyone knows two is better than one). That's not right. The The "Core Solo" and "Core Duo" followed the Pentium M and were succeeded by the "Core 2 Duo". For the first one, the chips included an internal CPU clock mutliplier. External clock is irrelevant, because pipeline frequency is the one that matters. 486 pipeline is still single-issue, hen?e scalar. Either way it is just a semantic argument about something that was superseded almost two decades ago. From the point of view of Intel engineers and the rest of world, Pentium was first superscalar Intel processor. Just I need to +1 Demonkoryu because Pentium M was super important in recent intel history, and they actually used the Pentium Pro design as a base, and incorporated modern and powerfuls speculative systems from the P4. So back to a shorter pipeline depth to regain raw performance rather than the marketing driven disaster that was the P4. Its deep pipeline was just an unfortunate necessity for the will to rise frequency from marketing department. @Frob: The PS4 is going to have an Octo-core x86-64 based processor, probably less powerful than the cell processor if I had to guess, but way more practical (and cheaper). The thing with the cell processor, at least in the PS3, was that actually writing code that can take advantage of such massive parallelism is incredibly difficult. Heck, most common programs on a typical PC are only single-core because either there is no need to parallelize or even when there is because its incredibly difficult to write really good parallel code. I don't know for certain, but I'd be comfortable making the bet that not a single mainstream game on the PS3 came anywhere near utilizing the proc's full capabilities... and I doubt any of them really needed to. C++11 has, theoretically made multi-threading rather easier, and the .NET framework does provide some pretty good, simple parallelism tools for simple cases (ie: Parallel.ForEach and a fairly effective automatic work stealing task architecture) but even then writing good parallel code for complex systems (like games) is still quite difficult. Yes, it is a pain to work with the PS3. Several of my game credits were on cross-platform games that included the PS3. The Cell architecture is fun to play with, but hard to work with. It is far better than the PS2 was. The PS2's processors were neither fun for play or work. As for the PS4, it isn't released yet so to say anything about it would likely be a violation of NDAs. While it would be nice to see automatic multithreading, that particular advancement is one of the smallest gains you can get. To do it right you need to completely understand your algorithm, partition the problem in to the correct work units (which is a hard task), study the actual communication between tasks (which is also hard), agglomerate the work units into communication clusters, then map the data back to individual threads and CPUs. Unlike an automated facility for multithreading bits of obviously-parallel work, the PCAM process will usually transform the algorithm and give a significant speedup. I trust the compiler and optimizer to make pigeonhole optimizations to automatically parallelize and vectorize loops and other small blocks of my code. That doesn't bother me. I do not trust compilers and optimizers to completely transform my linear algorithm into a parallel-processing friendly format. That requires a level of understanding far beyond anything normally done in compilers. though this does make me wonder some how the Intel and AMD CPUs are similar or differ on some of these points (I am personally mostly using AMD chips). The AMD pipline is similar, but not identical. I found one write up on hothardware.com that provides an image similar to mine above, but focused on AMD hardware. Their article has a different focus so they include more details on the cache (their purple, green, and violet areas), but otherwise you'll notice the model is similar. It still follows the same pattern: Instruction cache --> fetch --> decode --> alias (they call rename) --> schedule --> process (they have 2 integer, 2 floating point, one load address, and one store address processor compared to the six above for Intel) --> retire. They drew the ROB off to the side rather than as a step, but that is an implementation detail. The major difference is that AMD's floating point hardware is separate from the integer hardware, where Intel keeps them together, and that the usage of internal processors is slightly different. (They both still have six). Exactly how the difference affects performance varies from program to program. mostly it is just that over the years I had done some optimizations based on experience, and I am left wondering if the performance behavior would turn out differently on other chips. granted, not that any of this is unusual (it seems that fixed-point is pretty much standard in A/V codecs anyways...). Can I forward and translate to Chinese this article to my blog? Hey guys, I'm making a website for my project and one of my friends told me I should include a social media link despite me believing is not necessary. Therefore would like to hear about based on your knowledge and experiences on which social media would be the most effective way to engage with players.